Kitchen remodeling is exciting. We enjoy watching homeowners consider one idea over another one, this color or that? The individual choices you make for each area of your kitchen are what set it apart from every other kitchen in the neighborhood. Eventually, you will have to choose the right ceiling, lighting, backsplash, wall color, cabinets… but for now, let’s start with the countertops. Here are 15great countertop ideas that may help you make that final leap into the remodeling arena. Reclaimed Wood – Wood from your great grandfather’s old barn that you love is a great way to bring a piece of history into your kitchen. However, please be aware that reclaimed wood should be thoroughly examined for pests and rot before use. It is more expensive than many other countertop choices and installation cost will be higher. Maintenance of this type of material may drive some people crazy. These counters need to be routinely re-sanded and refinished to keep up with the porous openings inherent to the wood. Butcher Block – Using butcher block as a part of your countertop is an excellent idea. It is extremely durable for cutting and placing hot plates. Butcher block is easy to maintain by using a little mineral oil on it regularly. Mahogany – This reddish tented wood carries a rich, subtle beauty that will make your countertops pop. The richness of color has a timeless appeal. Be aware of maintenance issues, as with all wood products. Teak – Bring a bit of the ocean into your home with teak countertops. Teak works especially well in the bathroom. Shower seats are often constructed of this material. Zinc – Zinc is an incredible metal that provides an industrial appeal and develops an amazing patina in time. Zinc naturally resists mold and mildew and it is anti-bacterial. On the down side, zinc warps and scratches easily, so it is imperative to use trivets and cutting boards when working on this surface. Stainless Steel- Another metal that is perfectly acceptable tp use in the kitchen. Millions of commercial kitchens use this surface. Stainless steel is resistant to water, heat and stains. It is non-porous, so germs, mold and bacteria have no where to hide. Stainless steel looks perfect in a modern kitchen, although some people feel it looks cold and industrial. There are a few draw backs to using stainless steel as your countertop material. For one, it will scratch. Two, it can dent. Three, it is noisy. These problems can be lessened by; using a cutting board to prevent scratches and investing in a heavier gauge stainless and have it professionally installed over a hardwood substrate. As for the noise level, if you find the clanging pots and pans to be extremely annoying, this may not be the countertop material for you. Quartz – Quarts countertops are extremely popular because of their durability and the extreme variances in color and veining. It is one of earth’s strongest materials and the second most common mineral in the world. 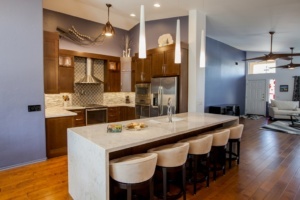 Quartz countertops are comprised of 93% crushed quartz crystals and 7% polymers. Along with other duties, the polymers allow color transitions making quartz available in a wide variety of gorgeous colors. This work surface is heat resistant, stain resistant and almost scratch proof. Quartz countertops practically pay for themselves as they are so popular and add a great deal of value to your home. Quartz comes from the Alps, Madagascar, Brazil, Japan, New York and Arkansas. Quartzite – Quartzite is a very dense natural stone that can be cut into a pretty amazing countertop. It is actually harder than glass and can cut into it. Quartzite, in it’s purist form, is often mistaken for white marble. Impurities add incredible patterns and colors. A true quartzite will not etch from acidic foods. Quartzite can withstand more wear and tear than other countertop materials. It is more expensive than granite and comes from quarries in the Appalachian Mountains, Texas, Utah and Minnesota. Granite – One of the most popular, durable and elegant countertop materials available, granite is both heat and stain resistant. It can take a lot of abuse and is a perfect material for families with young children. 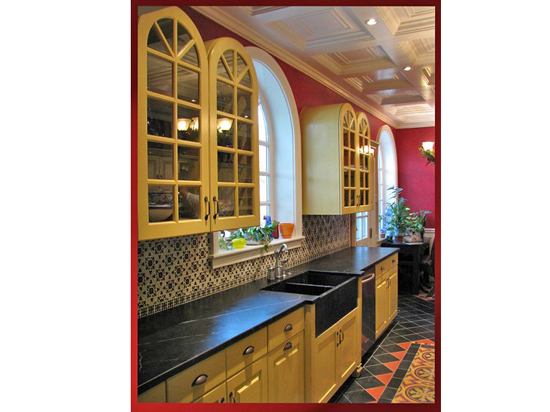 Granite countertops are available in a variety of beautiful colors and patterns. Granite will continue to look gorgeous years after it has been installed, as long as it is sealed. It will also add to the resale value of your home. Marble – An all-time favorite in some of the most beautiful kitchens in the world, marble is truly timeless. The variation in colors and veining make each piece very unique. Marble is distinctive, elegant and stunning. There are drawbacks to using this material on a countertop, especially in a kitchen. 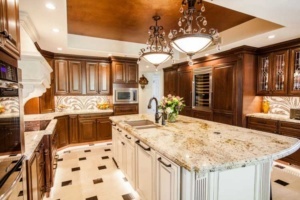 Countertops take a lot of abuse in a kitchen setting and it is common for marble to etch, chip, scratch and stain. It is rare for a marble countertop to look as good as when it was installed, even in as few as 1-2 tears after installation. Stains are difficult, if not impossible to remove and they will occur even if the stone is sealed. Marble is often used in a bathroom setting, please be aware that it will etch from shaving creams, toothpastes, soaps and make-up. Soapstone- It actually contains talc, among other minerals and some varieties will leave talc on your skin when you touch it. Soapstone holds heat and retains it for long periods of time. It is stain resistant, non-porous and can handle high heat. When quarried, it is a pale gray in color with light veining. A richer, darker gray color can be achieved by either using mineral oil or letting it naturally age with time. You can easily tell if the counters need to be re-oiled if a water spill leaves a mark after being wiped off. Minor scratches will go away with an oiling, but major ones will need to be sanded out with a fine sandpaper. Never use harsh abrasives on soapstone, as it would damage the surface. Corian- This is the oldest and most popular manufacturer of solid surface materials for countertops. The composition is approximately 33% binding agents and 66% minerals, making it both non-porous and stain resistant. The manufacturer does recommend using a trivet under hot pans to prevent warping. Color pigments give Corian a great variety of color/pattern options. One of their series has complex, non-repeating patterns that emulate natural stones like granite and marble. Another series has flecks of silver and gold that give it reflective qualities that can make your counters “pop.” The latest series called “Charging Surface” uses an adapter attached to your mobile device that then allows you to charge the device by simply placing it on the countertop. Corian can be easily cleaned with soap and water, commercial cleaners, even ammonia based cleaners. Be aware that window cleaner will leave a residue behind that dulls the finish of Corian. Hard water stains are easy to remove with a non-abrasive pad. Give us a call or message us on Facebook to talk about these countertop options or others you may be considering. Tri-Lite Builders is a premier remodeler in the Phoenix, Arizona area. 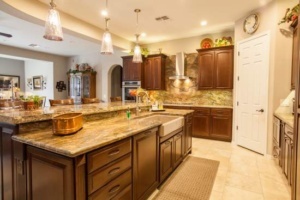 We provide top notch remodeling services to homeowners throughout the greater Phoenix area. Give us a call at 480-895-3442 if you would like to discuss your upcoming remodeling project in detail or schedule an appointment for a consultation.